I'm just starting to learn ISE with the Papilio Duo. 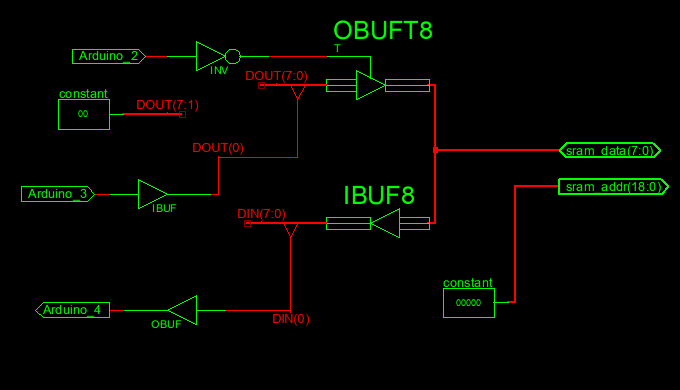 My first step was to create a circuit to read & write 1 bit from the onboard SRAM. However, I've hit a wall that I can't understand how to work around and was hoping someome could helpme figure it out. ERROR:Xst:1850 - Unable to insert IOBUF on port <sram_data<0>> in unit <SRAMOutput> having KEEP_HIERARCHY constraint. There are feedbacks in other units. Searching the Xst forums suggests turning off the KEEP_HEIRARCHY constraint, but it is already off in the settings and I don't understand why it is an issue since I have no other components / levels.